"[Conventional] wisdom on Tibet among Chinese officials is that when the current Dalai Lama dies, the Tibetan problem will be solved. China has tight control over the mountainous region and believes it holds all the cards. It can choose the Dalai Lama’s next incarnation and that will be that. So Tibet-watchers have greeted with surprised interest the interview of a leading Chinese scholar on Tibet, published this month in a Hong Kong magazine. In the interview, for almost the first time in a generation, a senior government adviser suggests that China’s Tibet policy of economic development with continued political repression is not working and needs changing. The official, Jin Wei, is no Tibetan-hugging softy. She is the director of ethnic and religious studies at the Central Party School, a think-tank in Beijing. 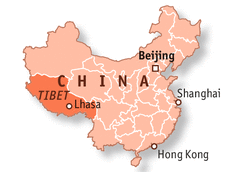 She takes the standard line that Tibet is an inalienable part of China (something most of her countrymen believe, too). But she suggests that the way the Communist Party treats every cultural and religious problem in the region as subversive is making things worse. Some clashes over culture and religion are unavoidable but manageable, she says, and they should not be seen as a threat to the state. Ms. Jin says that stalled talks with the Dalai Lama’s representatives should be restarted, and suggests inviting him to Chinese soil in Hong Kong or Macau. Most controversially, she suggests China negotiate with him about his next incarnation, and in the long term, allow him to return to Tibet itself."